Trying to find the difference of an electric toothbrush and a conventional one? Right both of them are designed for cleaning the teeth. However, the modern and sophisticated electric toothbrush helps to keep you away from adverse brushing habits, and it is also effective at brushing the almost inaccessible spots of your oral part. So now more and more people will choose a best electric toothbrush from the brands, to make their teeth much healthier. For gentle brushing of your gums and teeth, you can start relying on the electric toothbrush. You will get better result from an improved technique of cleaning the teeth regularly. It is helpful to prevent various gum diseases, cavities and gingivitis. And it is also the right option to those, who are wearing braces. Want to know which type of electric toothbrush is right for you? You will find the answer in the reviews on the 10 best electric toothbrushes. If you have used Pro 1000 and Pro 3000, you will surely realize that Pro 5000 is much different from them in design. It is slightly taller and thicker than these models, and the silver-white color scheme, applied to it, makes the product look sophisticated. Integrated with Bluetooth technology (4.0), Pro 5000 is really one of the most innovative and technically refined toothbrushes. Motor system of the product helps in the oscillation of bristle-filled head at a higher speed for the removal of germs from teeth and gums. However, it is the Bluetooth-connected Smartphone app, which makes the product unique. The app gives you updated information on the effectiveness of your teeth brushing activity. It saves data of the last twenty cleaning sessions. While the present session starts, this app shows you a timer. You may also set Bluetooth connection with your brush handle. This handle starts vibrating after every thirty seconds as a reminder for moving to other oral parts. While you have done brushing, this app reminds you for cleaning your tongue or flossing. You can choose any of the five modes for brushing your teeth with Oral Pro 5000. Those modes include: Tongue Cleaning, Massage, Sensitive and Deep and Daily clean. You have also the option of choosing the brush heads of any type, considering your own preference. Daily Clean mode is intended for everyday brushing with 3-dimensional movement, and with 8,800 oscillations. While you like to treat your gum, you may choose the mode of massage. Those, who have bleeding and inflamed gums, can choose this mode. The Sensitive mode works at very low speed for cleansing the gum and teeth. You may also turn on Whitening model for a longer cleaning process. After a two-minute normal cleaning, it treats your front teeth for removing all the stains. The last mode, Deep Clean lasts for three minutes, and this is the longest cleaning session. You have to charge your Oral-B PRO 5000 fully, and it will continue serving you for ten days, when you use them regularly. The handle also has a red-light indicator of charge level. To make sure that this battery is holding the highest capacity, you have to deplete it with no in-between charge. You may do it minimum one time on every 6 months. 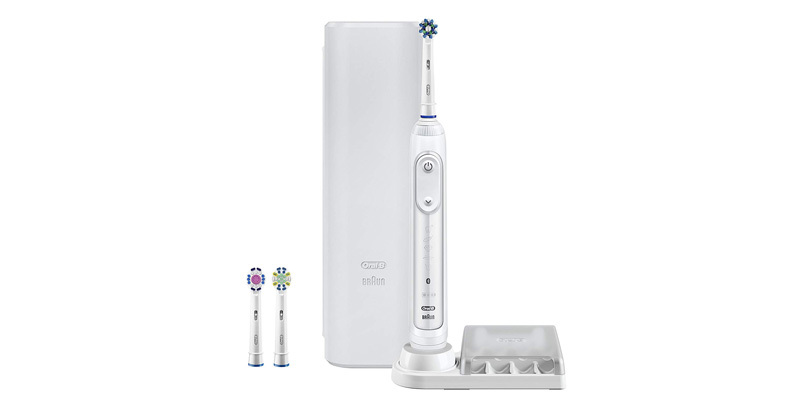 Oral-B Pro 5000 presents you with all the useful features, and it is professional in design. It helps you with timed teeth brushing to prevent any dental issue. I think it is a worthwhile electric toothbrush, and oral-b is also a brand you can trust. Long battery life of up to 3 weeks. 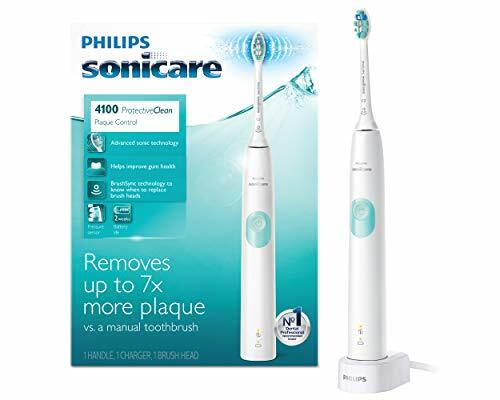 From most of the best electric toothbrush reviews on internet, we have found out that Philips Sonicare is one of the reliable products to keep up the oral health of all users. With lots of improvements, the cleaning functionality of the toothbrush is highly useful for those, who smoke and drink coffee regularly. There are two modes for operations and 6 settings for the users. One of them is the cleaning mode that enables the brush in cleansing the gum and teeth within 2 minutes. Another one is White mode that is intended for the removal of stains. For the fastest brushstrokes, you will feel an electric effect. Thus, you may choose the better mode for your brushing purpose. Smart timer is another feature of this best toothbrush, which helps you in brushing for the right duration. The manufacturer has used a technology, known as Quad pacing, and it helps to make sure that all the teeth have got the appropriate level of treatment. The timer, working for 30 seconds, is best for balancing the brushing effect. Now, while talking about the design, we like to say that you can get a slimmer toothbrush with more than 30,000 brushstrokes per second. By using DiamondClean brush head, you can remove all the dirt from your teeth. The bristles are triangle in shape, and make the repetitive motion smoother. They are not much stiff, and that’s why they won’t cause any negative effect on the sensitive gum. However, you have to fit the right replacement parts for your toothbrush. The battery charge lasts for 3 weeks, and the system has 2-color for recharge notification. The package includes a charger to charge the battery anytime. You will also get one travel cap for keeping up the hygiene of the brush. You may also use the travel case, included in the package. Moreover, the fluid action for this technology is much effective to clean the tongue and remove the odor from the gums. This energy-friendly technology has made the product different from toothbrushes of other brands. 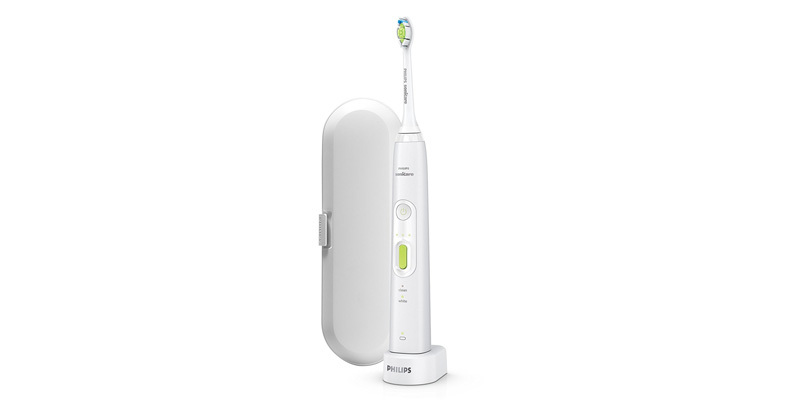 Use this Philips Sonicare toothbrush and enjoy a better gum condition within 2 weeks. For plaque removal, it is seven times more effective than that of a regular toothbrush. 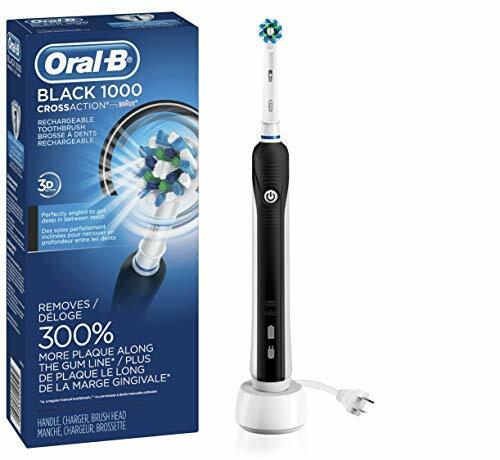 It is a black colored electric toothbrush from Oral-B, and you can operate it very easily. 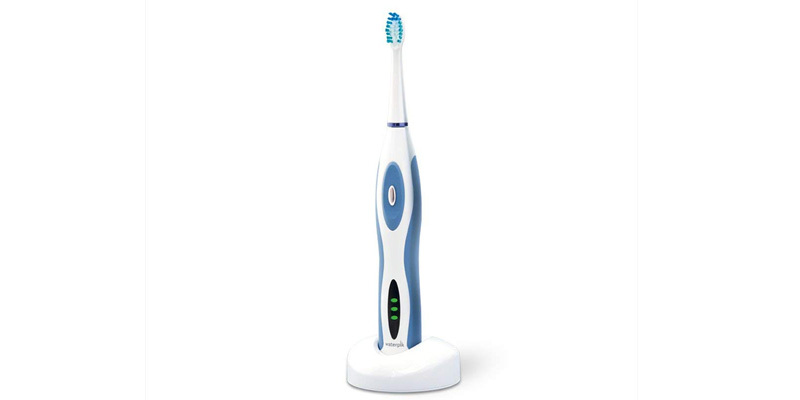 There is one power button at the front side of your brush handle, by pressing this button, the action of your toothbrush gets activated or deactivated. Moreover, you will feel comfortable due to the rubber grip, whether your hand is dry or wet. The manufacturer has also included 2 indicators in the design. One of them looks as the electric plug, while another one appears as the battery, these indicators help you to know the condition of the battery. Oral-B has used NiCad battery, and it has claimed that the charge can be retained for one week. You have to read all the instructions, given by the manufacturer, and it is better to discharge this batter two times on every year. One of the best things is that there is no risk of overcharging with this battery. At the bottom part of your brush handle, there is a small sized recess as one of the handle parts. While you are looking for the low-priced electric toothbrush, you may choose this one. However, since it is a clinically tested product, you will surely get the superior result. For the purpose of deep cleaning, Oral-B PRO 1000 is the right product to you. CrossAction brush head, attached to this gear is the most effective feature. It has a round-shaped head, which helps in cleaning every tooth. The criss-cross tooth bristles have been adjusted at an angle of sixteen degrees. Thus, they can reach all the parts of your teeth for removing lots of grimes from them. Oral-B has another similar product, Sweep Triaction 1000, and you must not confuse it with Pro 1000 CrossAction, However, the difference is in the color of rubber grip. The head of this electric toothbrush slides simply onto its shaft, and you have to just pull it for removing it. Thus, you can swap over the head within two to three seconds. The blue colored bristles can start fading, and thus, you have to replace the head regularly. While you have attached a brush head, the overall length of the product is 9.25 inches. Some users have said that it is slight bigger to place on the bathroom cupboard in an upright position. This Brush heads are interchangeable, and they have added versatility to the product. And this Braun powered brush is also good in design. You may choose it as the best electric toothbrush for your everyday use. This toothbrush really offers the most powerful and effective cleaning solutions. With the application of forty thousand micro-brushes for every minute, the toothbrush cleans out the debris, hidden in the teeth. Removing the stains is not easy with any regular toothbrush. However, this electric toothbrush helps you with 100 percent stain removal capacity. You will get back your fresh, white teeth by using this technologically sophisticated brush. Continue using the brush for seven days, and you will realize the improvement of your gum health and teeth condition. The weight of this toothbrush is 55 grams, and it is much lower than other brushes. You can easily hold the toothbrush, and cleanse your teeth thoroughly. The brush will not create much noise at the time of cleaning. The mini brush head is intended for the precise and deep cleaning process. The bristles are soft to prevent any type of teeth, gum and enamel abrasion.Five optional cleansing modes, available with the toothbrush, are also one of the positive features. White mode is the strongest one, and it is designed for the elimination of stubborn stains and plaques. Then, the Clean mode is of medium range, useful for everyday cleaning purpose. The third one is Sensitive mode, best for treating your gums. However, there is also Massage mode for manipulating the gum. Polish mode is intended for polishing the front teeth. The bristles are of high quality, and the manufacturer has used Dupont nylon for designing them. They are well for the topography of anyone’s teeth. These bristles have rounded top, and give the utmost safety to the teeth of every user. Fairywill has offered a waterproof brush with ananti-slip handle. There is also a protective cover over the bristles. As it is a rechargeable brush, you have to know about its charging system. Charge the electronic toothbrush battery for four hours, and you can use it for 30 days. With no application of USB cable and adopter, you will be able to use it. After getting fully charged, the system can shut off automatically. There is also a low battery reminder, integrated with the product. However, the brush is not designed for the kids below three. 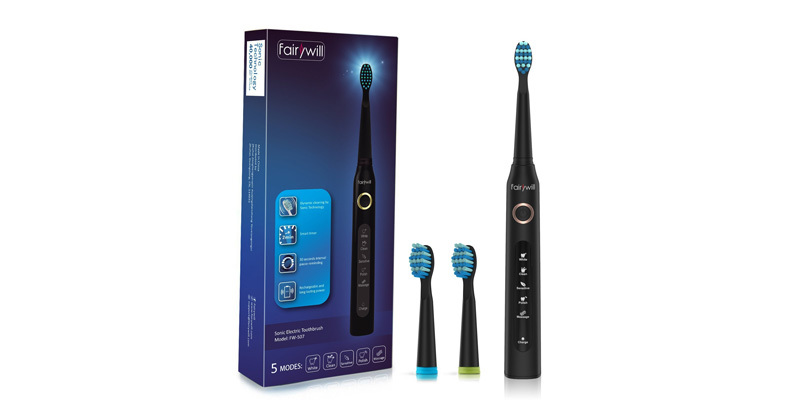 Now, start relying on Fairywill’s product for your oral health and hygiene. Our review will help you to know its features, which are useful for cleaning teeth. 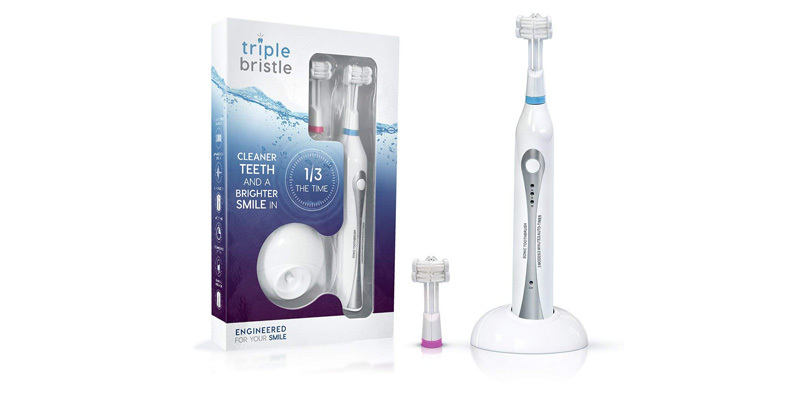 For those, who are looking for the best technology of electric toothbrush, this Triple Bristle brush is the right option. With its patented design, this brush makes your teeth cleaning process much easier. Within one third of the time, taken by a regular brush, this kit accomplishes its job. The manufacturer has taken a scientific approach for the purpose of cleaning. You will get whiter and cleaner teeth by brushing with this brush. This three-sided brush also reduces the plaque, bleeding risks and soreness in gum. Due to this 3-sided design, the brush can treat the back, front and top portion of your teeth simultaneously. It is a soft brush, causing no risk to the implants, dentures or braces. The angle of the Bristle Head of this toothbrush is also accurate, and cleans your teeth easily. The head is designed to clean all the crevices of the oral part. In addition to it, as the brush is able to remove the bacteria and stains, you will enjoy fresher breath. There will be no risk of the disease, like gingivitis. The sonic technology creates vibration and causes micro-bubbles for the thorough cleaning of your teeth. The teeth surface may have slight abrasion. However, you will have better cleaning result with this electronic toothbrush. The brush creates more than 30,000 strokes, and its Auto Timer is also good for pausing the process and for brushing all the teeth quadrants. Just like any other electronic brush in the market, you can find three different modes for the purpose of cleaning the teeth. 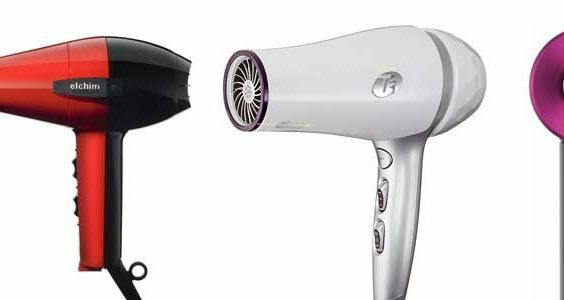 One of them is the Soft or Gentle mode, while other two include Massage or High clean modes. The handle of this toothbrush is also ergonomic, and you can hold it or grip it easily. For the users who have swollen hands, or arthritis, this brush works best. Thus, replace your ordinary brush with this electric one, and you will get all the desired results for your oral treatment. This battery-operated toothbrush gets charged very fast, and its high-quality battery may last more than three weeks. The charge indicator is also present at the base of the brush. And you can clean the brush easily with any wet cloth. Use this Triple Bristle Sonic Toothbrush for cleaning your teeth regularly. For better solution of your teeth and gum problems, you may invest on this electric toothbrush with special design. 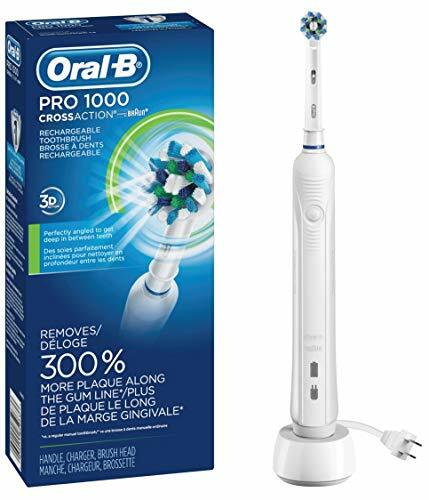 When you are looking for the latest product from Oral-B, the Pro 8000 is. While other brushes have three to five cleaning modes, this one offers you with 6 modes. For your everyday and ordinary use, you may choose Daily Clean mode. The Gum Care mode can massage and stimulate the sensitive parts of your gum. Whitening mode uses various speeds for polishing and removing the stains from the surface of your teeth. While you have chosen Sensitive mode, the speed gets lowered. You don’t have to use a separate tongue cleaner since there is Tongue Cleaning mode, integrated with this brush. It will brush away and remove the bacteria from your tongue. The last setting is known as Pro Clean, which helps with intense cleaning of your oral parts by using the faster movement of the bristle. 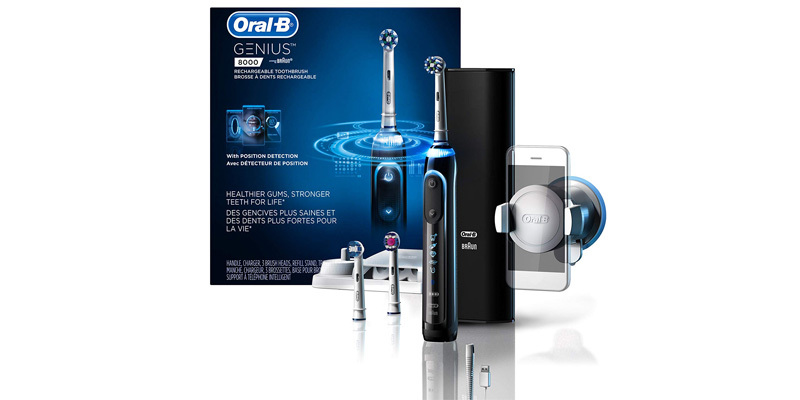 Oral-B 8000 has combined Bluetooth and sensor technology, and you can have a look at your Smartphone screen to know the parts, hit by the toothbrush. The pressure indication system, 360 SmartRing, is present in the brush. The indicator lights present an option of choosing any of the twelve colors for customizing the experience of brushing. The sensor and timer works consistently with SmartRing to send real-time feedback for the protection of gum. Your brushing time will be limited to two minutes. Another unique feature of this electronic toothbrush is the Position Detector. It helps you in viewing at the parts that are brushed and direct you in the adjustment of the brush movement. Thus, all the teeth can be covered very easily. For using Position Detector, you have to place the mobile camera, facing your mouth. In this way, the system can track and analyze the brush motion. A Li-ion battery helps in running the toothbrush, and you can charge this cell in a specially designed carry case. The interesting fact is that from a particular outlet, you can charge your mobile and toothbrush. The handle of your brush displays you the time for charging the system. This battery can retain its power for twelve days, and after that, you should charge it fully. Use Oral-B 8000 toothbrush to brush your teeth with its distinctive caliber. Follow a better and more effective brushing process. For technology, quality and design, this brush is popular to lots of users. You may try it out for your own teeth issues. 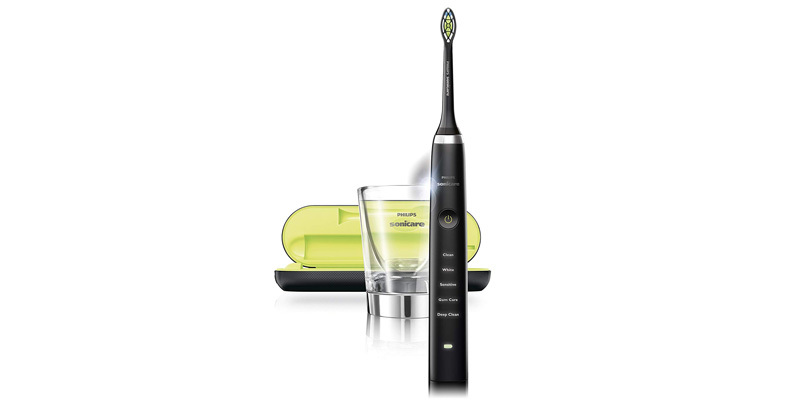 It is one of the stylish looking electric toothbrushes, available with the smartest features. At a reasonable price rate, you will get all the features. You can get five modes for brushing the teeth. These custom options include Clean mode for 2-minute brushing process, while White mode helps to eliminate the stains and brighten the teeth. Gum Care mode is intended for the stimulation of gum and Deep clean mode manages all the problem spots of your oral section. Sensitive mode is for moderate level of cleaning solution. The electric brush package includes AdaptiveClean brush head. This head is effective at removing your teeth germs at a ten times faster rate than that of the ordinary brush. Within two weeks, this brush helps you in getting back the whiter teeth. You may press power button for the consistent brushing cycle. If this is the first-time you are using electric toothbrush, you may choose the mode, which increases the vibration strength gradually. Philips has designed this device to give you the cleaner teeth. It also makes sure that the gums have become healthier. After using this Philips toothbrush, you will surely realize the difference of cleaning with an ordinary brush and that of the electric toothbrush. The timed automatic modes apply 31,000 strokes on every minute. The sweeping motions of the toothbrush are intended for driving more fluid to the gap, between two teeth. Thus, they can treat the deepest site of your gum. Quadpacer and Smartimer have made your brushing process easier and simpler. There are 2 timers, working for 2 minutes. Quadpacer starts its beeping action with an interval of thirty seconds to ensure that you have thoroughly cleaned the teeth. It is mainly the charging system that has made the product different. You can charge it wirelessly, and thus, you don’t have to place the brush rightly on the dock. There is a charging glass, having conduction system, it helps in charging your brush that is placed on the glass. And you may also use this glass for rinsing your mouth. DiamondClean’s toothbrush has rechargeable battery, which can hold its power for three weeks. The light for battery indication system gets illuminated while there is low charge. Philips is one of the reputed brands in the electronics market. 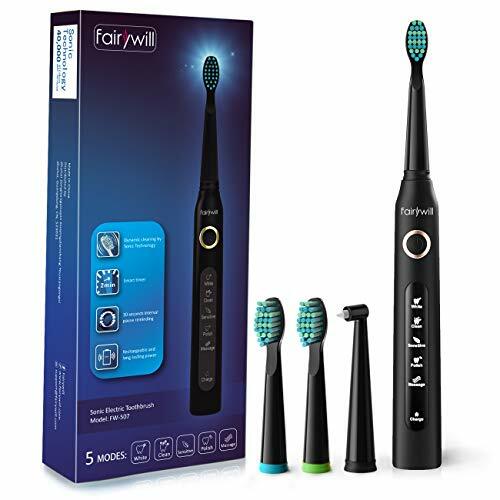 If you love its product, you may also buy the electronic toothbrush, offered by this brand. Lots of consumers have chosen it as the best electronic toothbrush brand. 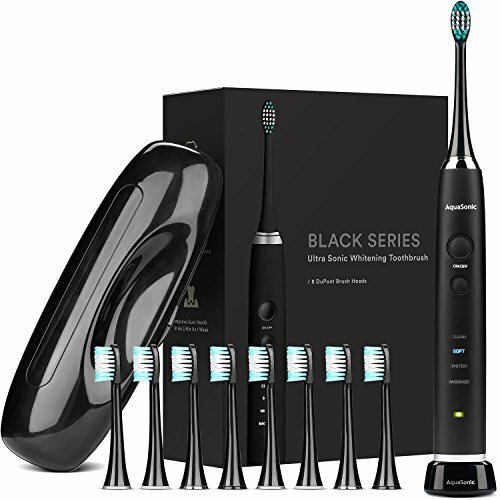 Pursonic is now one of the reputed brands to those, who are looking for the electric toothbrushes. Most of the customers have said that it is a family-friendly electronic toothbrush. You can pay for only one package, and use it for all the members of a family. There are twelve replacement heads, included with this package, and we think it as the best side of this product. You may feel that it can cause confusion on identifying your brush and that of others. However, you can find four color coding, and thus, it is best for a family, having four members. Now, while testing the functionality of the toothbrush, we have seen that its sonic technology has done a good job. It is effective at cleansing out the germs of your teeth. 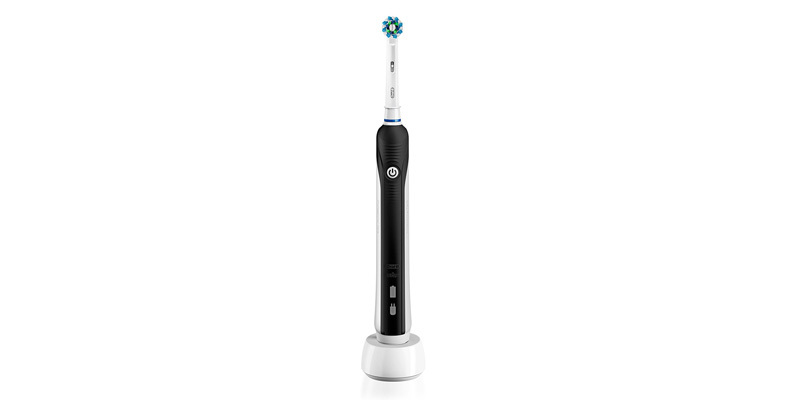 40,000 vibrations per minute enable the brush to clean your teeth deeply. 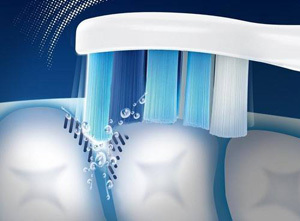 However, it is also true that some users do not prefer this vibration system, integrated with the brush, because they would get a tingling sensation on their teeth. But the irritation is common especially to those, who have very sensitive gum or teeth. 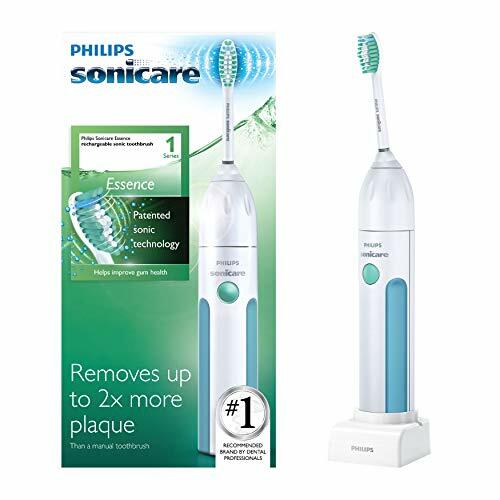 There’re three brushing modes in this Pursonic toothbrush. The normal cleaning mode is useful for most of the brushing purposes. While you have no dental problem and like to brush your teeth in every morning, you may click on this mode. Another one is the sensitive mode that delays the vibration level for preventing any negative effect on the sensitive parts. The last one is the massage mode, used for treating your gum. Pursonic has offered you a specially designed brush, which is good at massaging your gum. The timer is also present in the toothbrush. Each of the brushing sessions in this Pursonic toothbrush continues for 2 minutes, and you have to focus on every teeth quadrant. Although this Pursonic brush is available at a lower price, you can get timer and all other refined features. The handle of the brush is thin and lightweight, and you will feel comfortable to hold it. 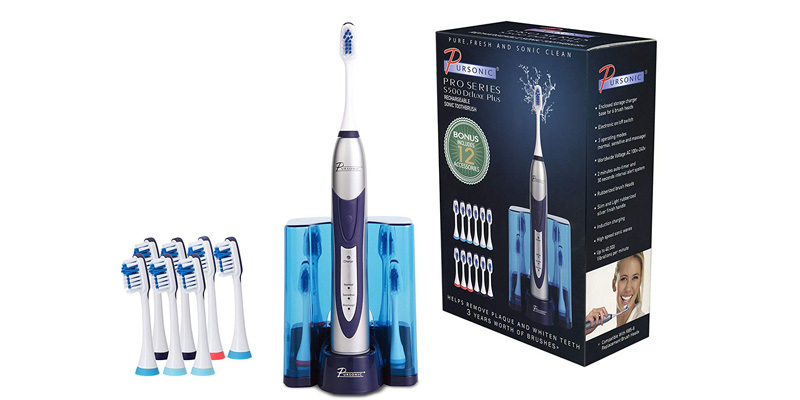 While reviewing other products of Pursonic, we have seen that S500 is much better toothbrush model from this brand. If you are looking for a Pursonic brand toothbrush, this Pursonic High Power Sonic Toothbrush would be your best choice. It is a very cost-effective electric toothbrush. It is another model from Oral-B, and is one of the top-quality brushes, offered by this brand. Clean the germs of your teeth safely, and have a view at the brushing pattern data by using the App and Bluetooth. There is nothing unique in the handle of this toothbrush. However, you can get four different options for choosing colors. The product presents you with a standard faceplate, which includes an arrow button and a power switch. You may use the arrow button for shifting to a different mode. Vertically placed small sized icons represent various modes for cleansing your teeth. While you have chosen any of them it gets illuminated. There is a ring of pressure sensor, and it is very close to the site, where the head joins the handle. This ring also becomes illuminated while you are applying high level of pressure. Thus, there is no risk for any injury or damage to your gums. The ring is viewable to you from all the angles at the time of brushing. We have stated that Bluetooth technology is integrated with Pro 7500, and it helps you to give better solution to your dental issues. It gives you a comprehensive guidance on treating the teeth or gum with the use of this brush. Download the app, Oral-B on the mobile, and then, turn on Bluetooth to have the instant feedback or data on your everyday brushing efforts. There is another feature: Focused Care, intended for the application of various instructions of dentist with a personalized brushing scheme. This feature helps you in following a routine, and you can easily meet your target for oral treatment. The battery life for Pro 7500 is very long, and after charging it fully, you can use it for some weeks. This is a Li-Ion cell, and it is better and more improved than that of Ni Cd battery, used for Pro 7000. 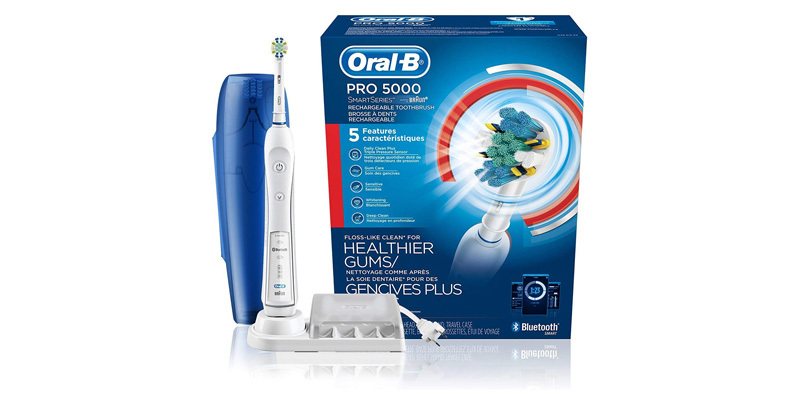 Overall, Pro 7500 is one of the best version in the series of Oral-B electronic toothbrushes. You can get it for any member of your house, and solve all the dental problems. Flossing and cleansing the teeth can become easy with the help of Waterpik’s electric toothbrush. Now, we like to assess each of the features of this electric toothbrush. The sleek handle creates the most pleasing look for the toothbrush. You may find that there are lots of toothbrushes, with weighty design. However, Waterpik has offered you the most lightweight one. The blue colored rubber grip, running down its handle’s side, is in the best position. The users can use their fingers to hold them comfortably. You may grip the brush in any way or with any hand. At the top portion of this handle, there is another button, which performs more than one function. By pressing the button, you can turn on or off the system. It also helps in toggling between various modes of brushing. As there is one button for all these functions, you have to press on it several times to switch functions . Now, at the base part, you can find the panel of charge indicator. You have to look at this indicator to know the battery condition of this Waterpik toothbrush. There are three indicators, showing the illumination of LED lights. With the charge of battery draining every day, the lower one blinks very fast. It gives you an alert that you have to recharge the handle. The NiMH battery is used for this toothbrush. The rear part of this toothbrush handle is very simple. There is just a horizontal rubber piece, which is placed at the base part of this handle. You may store this toothbrush on any bathroom counter. You have the option of any of the three types of brush head. The standard one gives you the utmost comfort, and its bristle part is of regular size.Some bristles are longer, and they help in the removal of germs from the teeth. The smaller ones work on your teeth surface. Another one is the compact head, which is much smaller in size and is best for kids or also adults. It is better to clean the molar teeth with this brush. For precise cleaning, this head is the right option. The last one is interdental head, and it may not be the right option for all the users. The narrow part of its bristles helps you in cleaning all the small gaps of teeth. Remember that you must not replace you flossing with this interdental head. Waterpik has offered all the above brush heads in its package, and gives you an opportunity for customization. Waterpik is now one of the reputed brands to the electric toothbrush users. Use any of the brush heads provide by them and make your teeth clearer and whiter. After going through all the users’ feedbacks and knowing their reactions, we have picked these toothbrushes. We have chosen the products from various brands, and you can find their difference. Our review will help you to make out the variation in different branded products, like- Sonicare vs Oral-B or Oral-B vs Philips. You may find the similarities among those products. However, all the brands have tried to serve every type of users. Which toothbrush type is best for you? Rotating – Its bristles rotate in a circular motion, and it is the low-priced option to you. Rotating-oscillating – They have very small and round shaped heads, popular in most of the Oral-B toothbrushes. The brush head rotates and oscillates in a direction for removing the germs. Counter-oscillating – Its bristle tufts spin in a variety of directions at the same time. Each of the tufts spins in a differing direction. Ultrasonic and sonic toothbrushes – They are vibration technologies, and thus, the brushes can start vibrating at a higher speed. However, the price rate of most of these vibrating toothbrushes is very high. Timer is one of the most useful features of electric toothbrushes, and in most cases, the timer is set for 2-minute brushing session. You can spend the right amount of time for cleaning each of your teeth. The electric toothbrush head and its handle have to be durable. Moreover, you must replace the heads after 3 to 4 months for enjoying the best standard performance. Most of the modernelectric toothbrushes have rechargeable systems, and they work with AA type batteries. They are also portable units to the users. Some users use cord for plugging, while others rely on the charging stand. Thus, choose any of them, checking other features of the brush. You must also know the battery life for the toothbrush. The battery can remain in the best condition for three to five years. Its charge holding capacity is also highly important aspect to the users. While you have started scrubbing your teeth harshly, it may clean the sites. However, this action has a chance of affecting your teeth in a negative way. Very high pressure on the teeth can harm you. That is why the brands have integrated pressure sensors with their products. These sensors help you to find out the level of pressure, applied on the teeth. The sensors warn you with a sound or a light. We have reviewed Oral B toothbrushes that have these features. The best electronic toothbrush stops the pulsation and starts to rotate simple for controlling pressure. The softer grip gives more comfort to the users. In most of the models, there is a rubber grip. Choose the best electronic toothbrush; hold its handle and start moving it over your teeth. There are various speed options that you can choose for brushing your teeth properly. While you have used the brush head for several months, you must replace it. Its bristles can fade slowly and start losing the color. The reliable brush brands offer you more than one brush head with their package. You may choose any of those heads for the best results from brushing. By picking the right head, you can whiten the teeth or clean the tongue. There are also circular shaped brush heads, which help you in accessing the rear teeth very easily. Do you like to travel with your electric toothbrush? The travelers have to choose the brand that offers travel case. While the toothbrushes remain uncovered during your trip, they may attract germs or bacteria. You may also store the battery in the case. Can your electric brushes become wet? Although there are waterproof toothbrushes, most of the brushes can get rinsed. The electronic parts, inside the brush, are properly sealed to prevent the access of water. The manufacturers give instruction on the way of using their brushes. However, you must not submerge the brush in water. Can one toothbrush be shared by others? We have seen that 1 out of 10 users share their brush with others. However, this is not a good step for them. The toothbrush head has bristles, which can attract germs and bacteria. Thus, there is a chance of having adverse result on your dental health. The best fact is that for electric toothbrush, the heads are replaceable. You just have to share the handle with other family members. It also saves your money as you may look for an electric toothbrush package, which offers various brush heads. Does an electric brush cause harm to your gum or teeth? These innovative electric toothbrushes never cause damage to your dental parts. However, you must know the way of using them in the right way. Thus, read our tips and comprehensive guide to buy the best electric toothbrush. Make your everyday brushing pattern healthier to you. These brushes reduce your concerns on various dental issues. Choose the electric brush and invest on it now to enjoy the desired result.